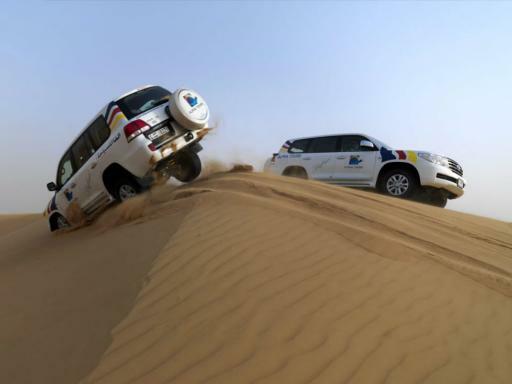 Riding in a luxury 4-Wheel Drive vehicle, experience the wild majesty of the Arabian Desert as you enjoy the thrill of ‘dune bashing’ – an exciting rollercoaster-of-a-drive over giant sand dunes. 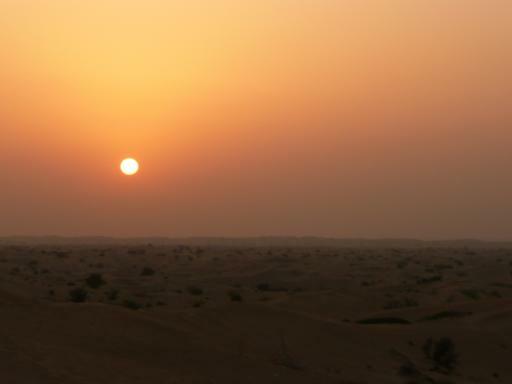 Then watch the full glory of a desert sunset before heading to a Bedouin Camp for a delicious barbecue dinner. 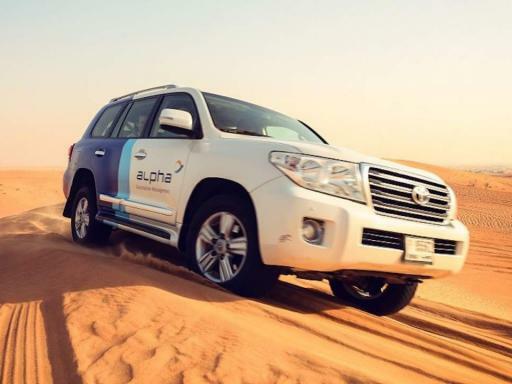 You’ll be picked up in a modern, air-conditioned 4-wheel drive vehicle and taken on an exciting dune drive across the the golden sands of Arabian Desert. 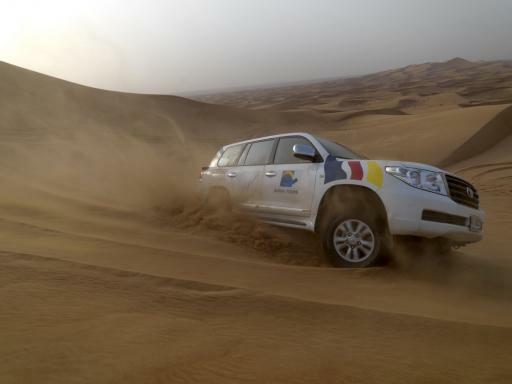 Your experience takes place in the Dubai Desert Conservation Reserve, the UAE's first national park.This unique reserve was created for the protection of endangered flora and fauna and the conservation of the natural desert habitat and heritage. Watch closely for wild animals roaming in this unique desert landscape before experiencing the exhilaration of 'Dune Bashing'. 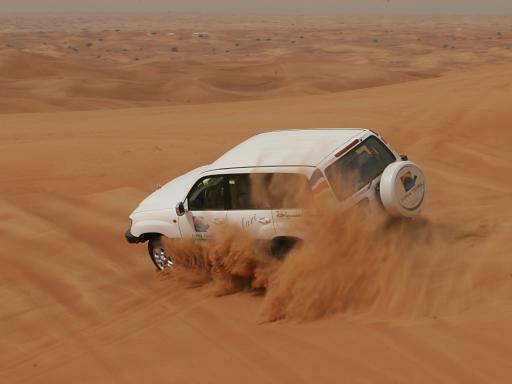 Race up giant sand dunes and plunge over blind precipices, provoking shrieks and laughter in equal measure! 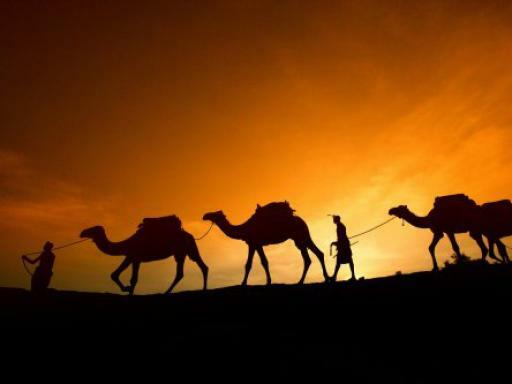 Afterwards, head to the top of the largest sand dune and watch the full glory of a desert sunset before continuing to an exclusive Bedouin campsite nestled deep in the desert. 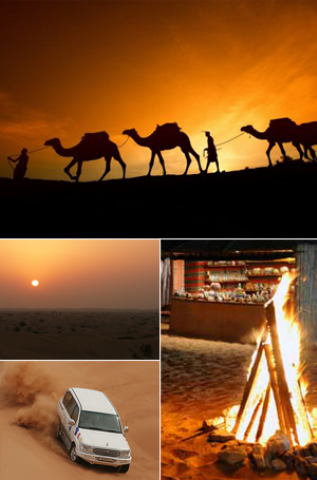 Here a warm traditional Arabic welcome of dates and coffee awaits and there is the chance to ride a camel or try sand surfing as a delicious barbecue dinner is prepared on open fires. If you wish, try traditional aromatic water pipe or Shisha or get a henna tattoo etched onto your hands or feet. Dinner will be served to you under the stars and includes shawarma and falafel sandwiches as starters and a BBQ buffet with side dishes, plus soft drinks, mineral water, coffee and tea. 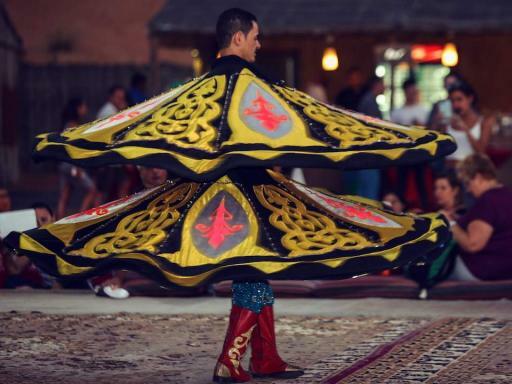 The Tanoura dancing and belly dancing under the Arabian sky make for a magical experience. 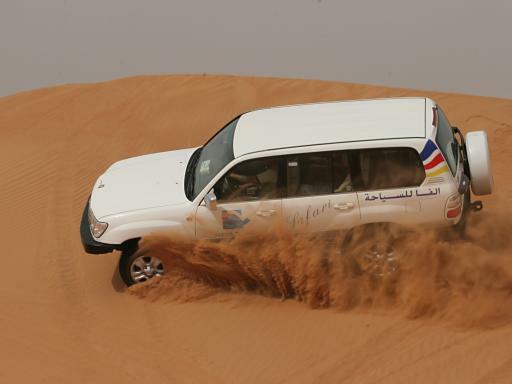 The luxury 4WD vehicles used are air-conditioned and carry a maximum capacity of 6 passengers plus driver. 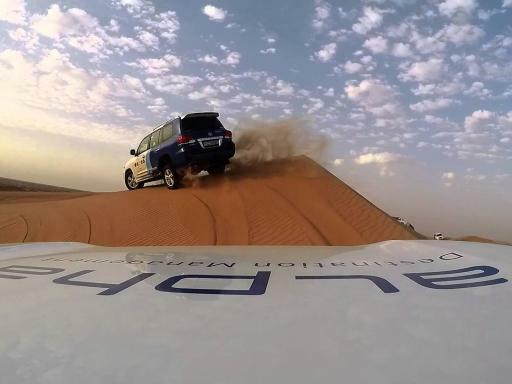 All drivers are qualified off-road professionals; first-aid trained and carry mobile phones. All vehicles are equipped with seat-belts and passengers are required to wear them at all times. This safari trip takes you through rugged routes intended to create an adventurous and exciting experience. Therefore, this excursion is not recommended for children under the age of three years, expectant mothers and over 65s. It is also not recommended to people suffering with heart conditions and back/neck problems. Start Times: 3.00pm - 4.00pm. Hotel pick-ups commence up to 30 minutes before the start of the tour. By far the best attraction we did in Dubai. 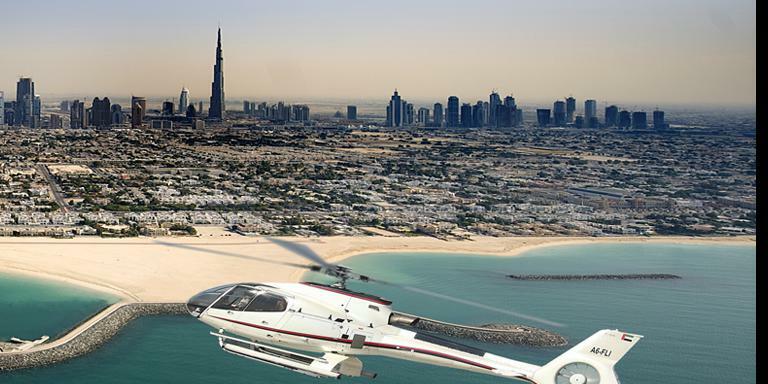 Pick-ups are available from Dubai area hotels only. This excursion is not recommended for children under the age of three years, expectant mothers and over 65s. It is also not recommended for people suffering with heart conditions and back/neck problems. 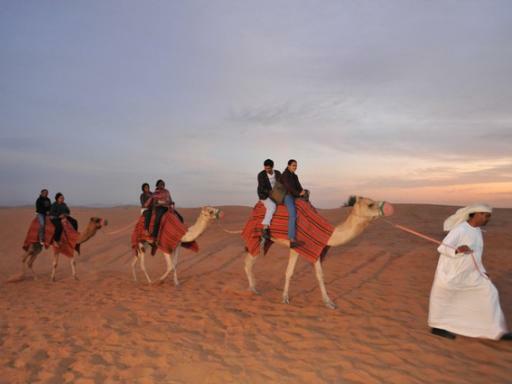 The United Arab Emirates has conservative dress traditions. Swimwear should be confined to the beach and hotel pools. Please note there will be no alcohol or belly dance show during Ramadan.